Through a couple attempts I came up with a design that would be cut from one flat piece which was a very efficient use of wood. Once I had glued up the first one I couldn't believe how awesome it looked and knew I had something special that really appealed to my design oriented mind. 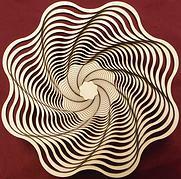 The first prototypes were cut using a scroll saw and I knew if I was going to make a marketable product out of it I was going to have to come up with a faster way to cut them. I found a local business with a CO2 Laser cutting machine who could cut them for me. I now own my own machine and my entire business is operated right out of my home.